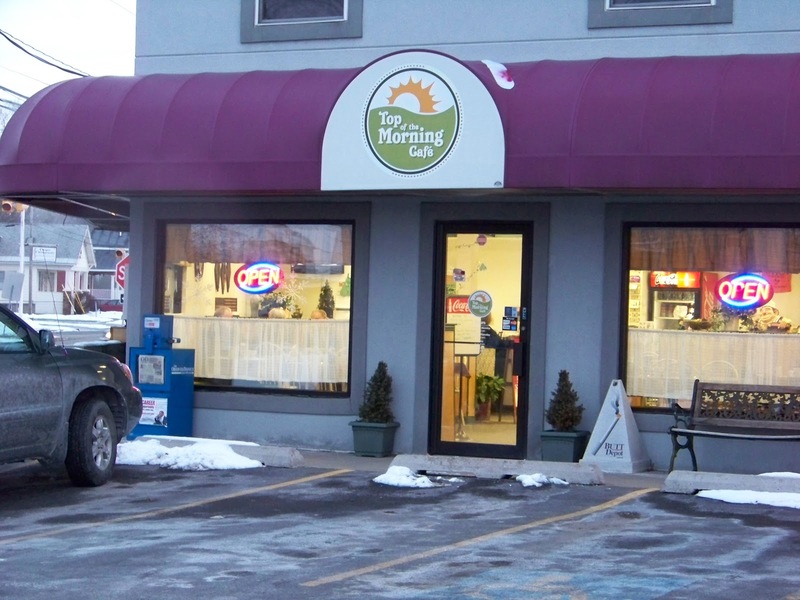 If you get hungry for breakfast while driving through Utica on the Thruway, Top of the Morning Café in north Utica, is a delightful, reasonably priced breakfast destination. On the winter morning when I came to Top of the Morning, I pulled into the parking lot half an hour before sunrise. The restaurant was bright and cheery in the overcast dawn. Inside, the restaurant has a large, bright dining room with a counter for diners in a hurry. On the walls are many appealing color photographs taken in Ireland. The photograph by my table showed the Cliffs of Moher, on the rugged west coast of Ireland. The waitress was welcoming, cheerful and efficient. On the menu are a variety of offerings. They include omelettes, pancakes, waffles and eggs. Also available are egg dishes made with egg whites and oatmeal. I started with coffee. It was hot and just strong enough. Then I had two eggs over medium, with dry white toast and potatoes. The eggs and potatoes were just right and not at all greasy. Although the breakfast was cooked to order, it was also served quickly. The café has a lunch and dinner menu. I did not look at them but, based on how well they prepared breakfast, this would be a good place for lunch or dinner. The café telephone number is 315-507-3141 and is about five minutes from Thruway Exit 31, the main Thruway exit for Utica. 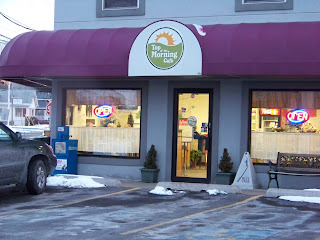 If you want to locate the café by GPS or computer mapping, the address is 414 Trenton Road, Utica, NY. 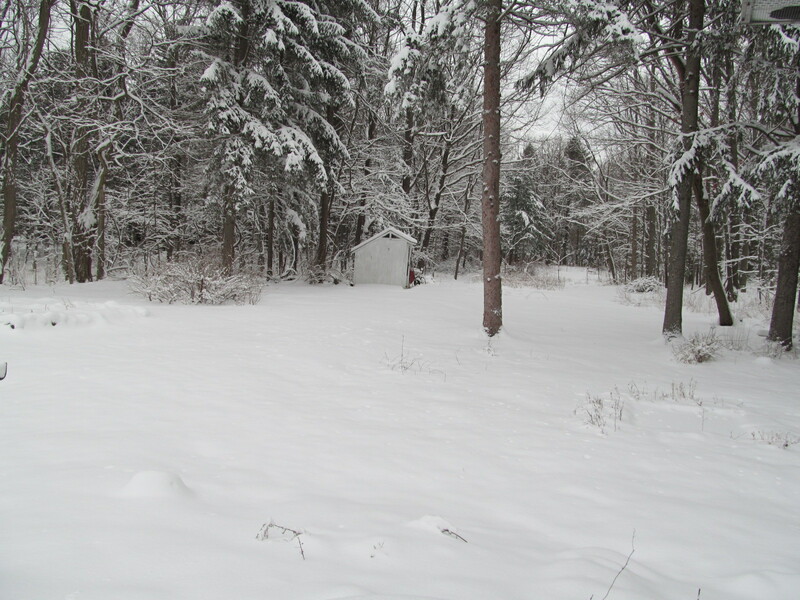 For now, it looks like the snowy weather in New York and New England has settled down. However, in mid-Long Island and mid-Connecticut, Nemo took its best swing, leaving up to three feet of snow. 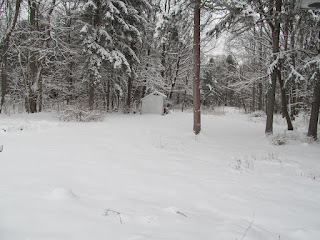 Actually, since writing this yesterday morning, one reader wrote that the deep snow was more widely distributed than I thought. There was 30.5 inches of snow 15 miles west of Boston! To all my New England and Long Island readers: hope you are dug out soon and that your power and other utilities stay on or come back on as soon as possible! 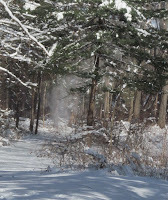 The snow was great for snow-blowing. ﻿ ﻿ ﻿ ﻿ In New York’s Capital Region, the snow fall was eight to 10 inches in most places. The snow is light and fluffy. 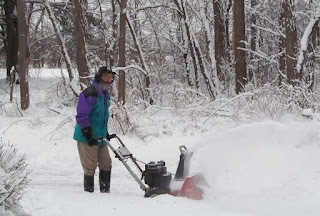 Thanks to the gift of a snow blower from my friend Don, clean up was easy. Later on, however, blowing and drifting snow across the highways may make driving challenging. Before the storm, some odd things happened. At Empire Wine and Liquor, a steady stream of people lined up to buy red wine - - probably a heart-healthy move for snow shoveling. At the Guilderland Hannaford, the shelves were thoroughly shopped - - but not stripped bare. However, all the shredded mozzarella was sold out. Did all those people at Empire decide they wanted a homemade pizza with their wine? If you have a story from this snow storm, please comment below. If the commenting software is too difficult to use, please drop me a line and I will add it in for you! Hot Creek, near Mammoth, California. 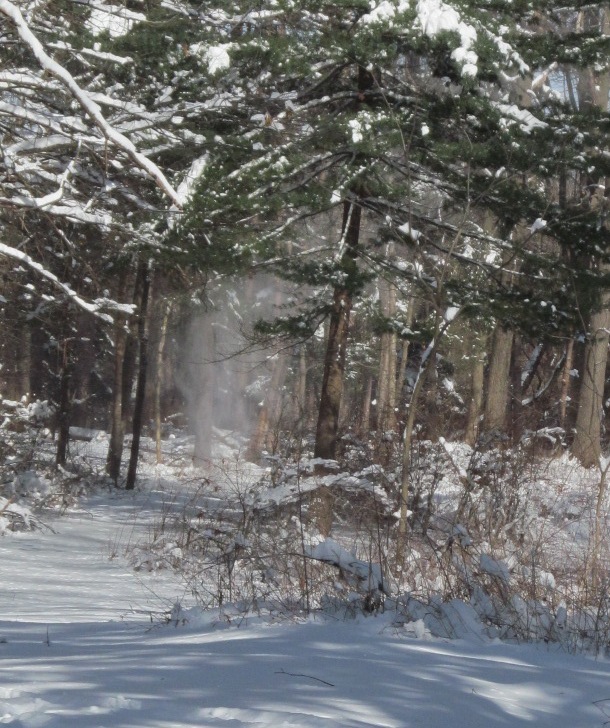 New York state's trout season is approaching faster than one might think, opening in less than 60 days, on April 1st. In many parts of upstate New York, it is tempting to compare this date for the first day of fishing with the jokes and pranks of April Fools Day. 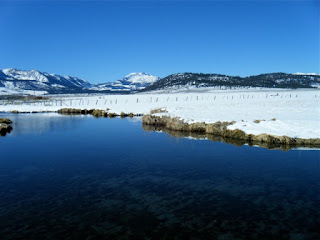 On a regular basis, hopeful anglers find streams inaccessible from snow drifts or ice - - or unfishable from high runoff. In 1983, Ben Lockett and I were fishing the Battenkill on Opening Day and found ourselves in the midst of a snow storm that felt more like February than April. Anglers have a doctrinal split about April 1st. Some people go because it's time to get out of the house. Even if conditions are bad or marginal, they think a bad day of fishing is better than a good day of a lot of other things. Others, say that fishing on April 1st is an empty ritual. They prefer to wait until the water warms up and the insect start hatching for fly fishing. Regardless of how you feel on this issue, Opening Day is getting ever closer. If you do not want to wait until then to fish, there is plenty of fishing around, weather permitting. New York and California, for example, have catch and release trout regulations where the fisheries are open all year. The picture at the top of this post is of Hot Creek in the eastern Sierras of California. 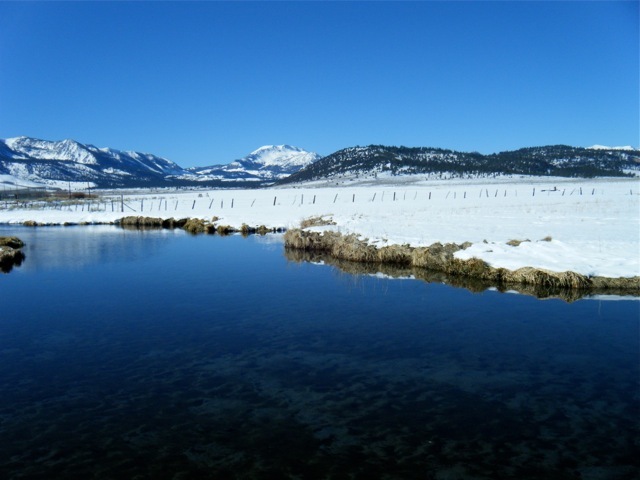 When Dennis Greninger was at Hot Creek, he saw an angler fishing with nymphs. This angler caught two fish while Dennis was watching.